Yep, I’m a Grimsby fan (it’s a birth thing) but I feel the plight of Torquay and other small, lower league clubs is something we should be concerned about as if they are lost then a key part of a community is lost. When I saw that our chancellor, George Osborne was investing £3m into grassroots football in China, the world’s 2nd largest economy I had to take a deep breath. Yes, I understand that palms need greasing in order to attract investment but to label it as for ‘grassroots football’ and to say that it might bring more money into the UK football sector shows a lack of understanding of that ‘football sector.’ In all but the Premier League, perhaps the Championship and some of the Scottish Premiership times are quite tight. So, like with all things I get a little tetchy about I wrote to my MP and I encourage you to do the same. About anything. Drop them a line, be polite and ask them what they’re doing about it. Recently I have been concerned to see my local football team Torquay United struggling financially. thing, for the local community and the people of wider Torbay but also their neighbouring teams in Exeter and Plymouth who benefit from local rivalries. The loss of a team mid-season would also affect teams around the country who would lose gate receipts if fixtures are not played. Now, you’re probably wondering what this has to do with you as an MP and indeed Torquay United is not even in your constituency, instead it sits in your colleague Kevin’s Foster’s Torbay patch. Why would the government be interested in bailing out a football club which to all intents and purposes operates as a business? Businesses might go bust every week. Any keen football fan in China will already be more than aware of the Premier League and while not the largest market for the PL it will undoubtedly grow to match that in other Asian countries when it is renegotiated at the end of the current deal. I understand fully that there are sweeteners and deals required in order to pave the way for Chinese investment in UK infrastructure as well as encouraging Chinese firms to bid for contracts in our new power station and HS2 projects although I would prefer to see UK or European firms given preference rather than money and profit leave the UK and maybe taxes not be paid due to some offshore status but that is another matter! One might argue that it is market forces which define whether a club survives, that if the fans and the community want it then they will turn up on a Saturday in sufficient numbers but I believe that the spread of money within the league structure is disproportionate and this plus aggressive positioning of the PL product by Sky and now BT Sport has left us with the smaller clubs and lower leagues unable to compete. Is it a monopoly? Maybe so. Torquay’s plight is good example of the absurd nature of Premier League vs lower league fortunes. By my reckoning their current shortfall at the turnstile equates to something in the order of £75k over the season but a top PL player, let’s say Wayne Rooney, can earn £300k in a week. In simple terms less than two days of Mr Rooney’s pay would keep Torquay United afloat. In real terms, in modern footballing terms, £75k does not seem like a huge amount of money but if a board does not have money to invest, new investment cannot be found and cost cutting measures cannot be implemented quickly enough it might as well be a million pounds. And that is why I am writing to you, my MP about the plight of a local football team. The government is investing money into grassroots football in China when that money invested in grassroots football at home would possibly secure the short term futures of a number of clubs, maybe even every club with troubles in the Vanarama Conference and League 2. These clubs might not be tempting to overseas investors but they are crucial to their communities, to their employees and also clubs around them and that is why I believe the investment is misplaced. I don’t know if you are a football fan or even a fan of any sport but I hope you can see that this might be more than just a sporting issue and rather a community issue and therefore something which might be considered. If there is another cabinet or committee member more appropriate, please forward this to them. I normally take a deep breath and think about what I want to say before I write to my MP. I normally let the first rush of anger and frustration subside before starting to type but this time I didn’t wait, I didn’t need to. I’m clear on what I think about the debate and vote on tax credits today and I don’t need to wait. I was doing some quick sums on the effect of the measures voted through today and I came to the same conclusion as many observers, commentators, unions, etc. 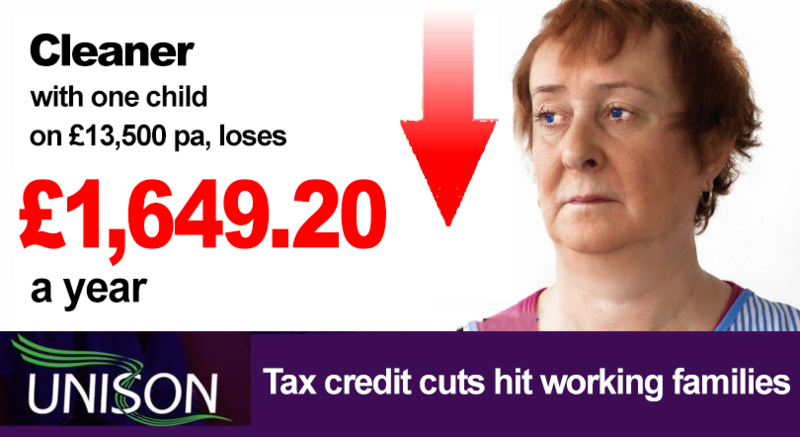 those in need of tax credits because of low incomes will find themselves with even lower incomes. Unison published this image which summarises it quite neatly and It’s chilling. A low earner just cannot afford to lose more than 10% of his income. Your MP probably doesn’t respond to the standard campaign emails, the 38 Degrees, etc, mine now has an auto-response to that effect, so take a minute to write something personal. Be concise, be polite and make sure he knows what you think. I use www.writetothem.com – go get ’em! My letter is as follows. I’ll post any replies and correspondence as a comment. I hope this finds you well but unfortunately many of my fellow constituents, colleagues and friends and many more in Great Britain will be less well as a result of the vote today on tax credits. The voting figures suggest a party whip rather than a free vote so I guess many of your party’s MPs will have voted for something which pulls the rug out from many of their constituents, something which will leave children hungry and the poorest cold this winter. I understand that tax credits subsidise low wages and also rising rents but cutting them before tackling wages and rents is cruel, irresponsible and frankly heartless. Many will accuse the Conservative party of being out of touch, of being detached from the realities of life in modern Britain and who could blame them? Can an MP or member of the Lords appreciate what it is like to have to survive (and I don’t use that word lightly) on low wages as the cost of living continues to rise? This change of the tax credit thresholds is targetting those who need help, it’s going to cut the incomes of single parents and families already struggling to make ends meet and the dependence charities and foodbanks will most surely increase. For one of the world’s richest economies that is quite simply disgraceful and those pushing ahead with the austerity measures; measures based on idealogy rather than evidence should be ashamed of themselves. We’ve all seen it on the news and in the papers over the last couple of days; we’ve seen the harrowing pictures of a children lying face down in the surf. We’ve signed petitions asking the government to take in more refugees and we’ve shared the Facebook posts and retweeted images, quotes and links to newspaper stories and opinions. We’ve donated items to be sent to refugee camps and maybe too we’ve slapped down a bigoted comment on one of the above but what else can we do? hello again, I wasn’t expecting to write so often during the summer recess but the crisis in the Med which has been growing over the last year and has now escalated into such a huge humanitarian disaster has made me think hard about what we should be doing as a country. Today your colleague George Osborne said we must tackle Islamic State and the criminal gangs trafficking refugees across the Med and through Europe as though they are the real causes but this would seem to be missing the point in so many ways. The trafficking gangs are surely but a symptom of a problem. Yes, they’re criminal but if there wasn’t a huge number of displaced people fleeing their homes looking for a safer life then these gangs wouldn’t need to exist? Forgive my flippancy but it’s a case of supply and demand. We must tackle IS/Isis but we should also hold our hands up and admit that if we blame IS then we must also blame ourselves as Western nations strengthened the insurgents in the rush to overthrow the Syrian President al-Assad with no real plans as to what to fill the void with; similar to the situation in Iraq after the overthrow of Saddam Hussein where IS first surfaced in fact. While we must assist in tackling the gangs and the insurgents we cannot stand by while people die fleeing the desperate situations they found themselves in following those western interventions. As one of the world’s strongest economies we have to participate more globally and act more responsibly but right now we should be doing everything we can as a nation to help every last man, woman and child by immediately providing shelter, food and aid alongside Germany and our other European neighbours. We should be investing in rebuilding the infrastructures we helped destroy in order to create safe environments to which those displaced people might wish to return. The Prime Minister asserts that we are at the forefront of efforts to tackle the crisis but this isn’t supported by recently published figures on the numbers welcomed by various EU countries. Was this a reference to our overseas aid budget maybe which is indeed large? I felt a little ashamed at the attitude shown by our government when compared to Germany’s stance on this. David Cameron said today that Britain would fulfil its moral responsibilities towards refugees and that we would take in thousands more but there are no specifics, no timescales and no definite figures. Is this merely a response to the outcry following the photographs of the poor child lying in the surf in Turkey? Our opt-out of the EU burden-sharing arrangements means we don’t have to stand alongside Germany and others in dealing with this but are we stepping up to the plate when needed? I hope that this really is a decision based on our actually ‘doing the right thing’ rather than simply looking to be doing it. It looks likely that the issue of the UK taking in more refugees will at least be discussed in parliament due to a petition or two gathering the necessary signatures for such discussion. Will that lead to a vote on the matter? Too early to say and the situation (and our stance) may change again before that but maybe writing to you and making my feelings known is useful for you in gauging the opinions of the electorate if a vote of some kind is to take place. I presume I’m not the only constituent doing so. Earlier in the year at the hustings in Moretonhampstead just a couple of weeks before the General Election, the final question of a lively evening was, “we’re a small island, when should we consider it full?” While you were heckled by some elements of the crowd I noted that you referred to the crisis in the Mediterranean, that we should be helping those that needed help and not standing by, stressing the need for more international aid rather than cutting it. I of course understand your position as a whip and that occasionally you might be required to vote and mandate other MPs’ voting on matters which might not necessarily be in line your own personal beliefs but maybe this is something where simple humanity trumps party politics and rhetoric. We can only hope. I believe that with unified cross-party statement of intent and positive positioning of the issue in the media and the public eye we can stand as an example to other countries and emerge a stronger, healthier nation because of it. All the best Mel, a couple more days and then back to Westminster next week!